Debauching the Bride of Christ; Transgenders Encouraged To Become Priests in Church Diversity Drive | Have Ye Not Read? “…the perception that the Church is homophobic and transphobic is harming our mission, especially to young people. In other words, within the Church of England just about any form of perversion now goes, apparently, including homosexual and transgender priests. And why? Because, the church Bishops say, failure to include the LGBT crowd “harms their mission” to young people. “It’s my hope that the work being undertaken…will send a very strong signal to LGBT+ people that they’re welcomed and valued on equal terms with our brothers and sisters. In other words, telling the perverts that they’re going to hell if they don’t repent and change their evil ways is no longer within the purview of the church. We must have “big tent” religion now, which means everyone’s welcome no matter what. It’s “all styles served here” religion. Except for one little problem: God doesn’t “welcome and care for all people.” He welcomes and cares for those who are sincerely repentant of their sins and faithful to His Word. Yes, He loves all of His children. But those who refuse to repent of their unrighteous behavior are ultimately cast out. He seeks to save them through the Gospel message, but makes it clear that if they fail to repent and turn away from their ungodly behavior, they’re going to die in their sins. In short, the Bible clearly teaches that such perversions are abominations to the Lord that rob the individual of His chance for eternal life in God’s family household. You simply can’t get into God’s eternal family household if you’re perverting God’s nature. I’ve repeatedly explained that what you’re witnessing today is the culmination of Satan’s occult so-called “magnum opus,” or “great work,” in which polar opposites are purposely being blended together in order to transform the globe into a “new way” that essentially estranges God’s children from God’s eternal family household. The goal of bringing homosexuals and transgenders into the priesthood of the modern church is to corrupt and debauch the bride of Christ to the point our Lord and Savior cannot accept her in spiritual marriage, but instead must condemn her for the egregious nature of her sins. This is one reason why only the faithful elect remnant will be considered by Christ to be His Bride upon His return. As I’ve taught many times, Satan’s goal is to debase God’s children to the point that they’re simply unfit to enter the kingdom of heaven. He knows he can’t defeat or otherwise harm God. Therefore, the only thing he has left is to put God into the position of having to destroy more and more of His children in the lake of fire. What’s more, according to TheChristianPost.com, transgender clergy are also becoming more accepted in the U.S. 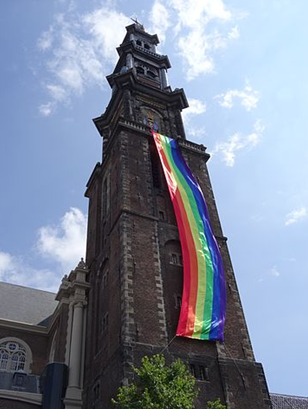 These churches included several diocese of the Episcopal Church, the United Methodist Church, The Evangelical Lutheran Church in America and the Lutheran Church. 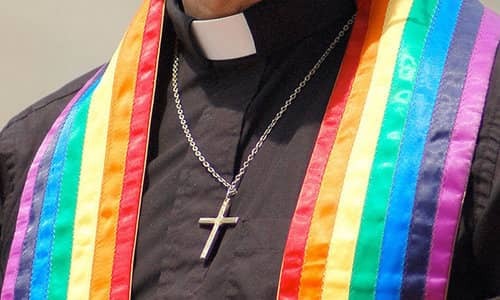 The Anglican Church in Australia has also ordained transgender priests. So the phenomenon of bringing transgender individuals right into the church clergy is not limited to the Church of England. It’s a growing trend. What’s more, it’s important to understand that this blending of polar opposites I’ve been talking about in recent studies and commentaries — including the blending of ordained homosexual and transgender priests into the clergy of major churches — is not limited to sexuality or gender. Polar opposite cultures are being blended through forced immigration. Fruits and vegetables are being mixed and merged through genetic manipulation. Insect and animal genes are being inserted into plant genes. And there’s much more, if you’ve got your eyes open. All of these blendings, mixings and mergings are against God’s Word, because they violate the principle of leaving God’s creation as He made it. We’re supposed to be faithful caretakers of God’s creation. As such, we’re to dress and keep (i.e., tend and preserve) God’s creation, just as Adam was commanded to dress and keep (i.e., tend and preserve) the Garden. We’re not to change and debauch it. We’re charged with preserving it. In other words, this merging of opposites is designed specifically to transform society globally, and ultimately to bring about the one-world religio-political system known in the book of Revelation as Mystery, Babylon the Great, Mother of Harlots and Abominations of the Earth. Those Bible studies will help you understand, through Scripture, what you’re witnessing today as this great global transformation continues to pick up steam. Don’t let anyone tell you this is a passing phrase or a fad. It’s not. What you’re witnessing today is part of the final “lap around the track,” so to speak, in terms of the powers-that-be preparing this earth for Satan’s arrival.